$60.99 & FREE Shipping on orders over $59. Reviews, NE IPA is fav. 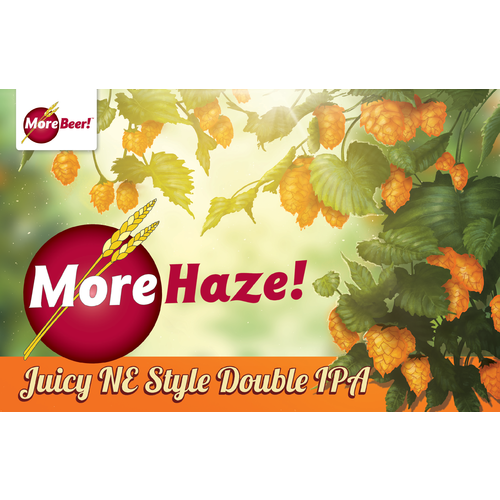 I love hazy IPAs, but have yet to brew one. Juicy Double is a cut name. Love the hazy IPA's and this looked awesome to make. love the citrus double IPA! 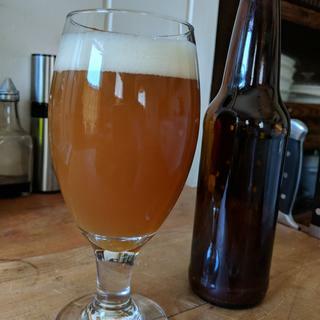 I've tried several NE-style IPA recipes and have yet to find a good one. Hoping this one is it! This is a present for my boyfriend who loves Hazy IPAs. Looks delicious and hopefully will be fun to brew. Tried Samuel Adams new NE IPA and it was really good and looked for something of similar style to brew at home. One of the best kits I've made. Look amazing. Recommended by a friend that bought it. IPA What could be better! Review soon to follow. I am a new to this. Do i remove the dry hops after days 3-7 in the primary and same for secondary? or do i just leave them in? BEST ANSWER: That is a great question. There lots of ways to approach this, depending on your personal tastes. However, that said, I think most brewers take the hops out of the primary after 3-7 days and remove the hops from the secondary after 3-5 days. For me, if I leave hops in greater than 4 days I start to get grassy flavors. I left the dry hops in both the primary and secondary. 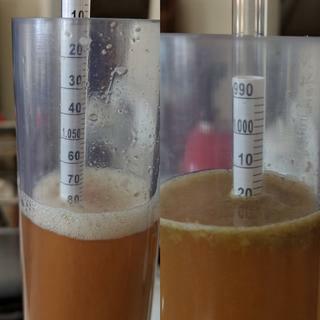 Seeing that this is a double IPA the trub was quite thick at the bottom for both the primary and secondary. I transferred to keg however i transferred to much trub and it clogged my line. Once I figured it out I transferred to another keg. I Let it carbonate for about 5 days and got a glass. Very tastie with a good kick of hops. Just leave them in. When you move the fermenter for bottling or kegging try to let it settle and keep all sediment in the bottom. Throw that sediment away. Based on your technique for bottling or kegging it will take practice. A little bit of sediment is ok and even preferred with a hazy, but still try and limit it. Can clog tools of equipment and taste off if too plentiful. Hello! Ieft them in & did not remove. I do recommend you place the hops in a mesh bag as I had a tremendous amount of settlement. I just leave them in. The directions are a bit unclear: Should I be transferring to a secondary after 5 days? This seems a little early, but that is how I'm reading the instructions. Also, would it be recommended to dry hop within a bag, or just right in? BEST ANSWER: Hello Tristan - In the directions we are referring to secondary as post fermentation. It is not necessary to rack the beer and move to another vessel. Concerning dry hop additions, I have found best results in not using a bag and pitching right in. What is the recipe for this beer? I'd like to look before I order it. BEST ANSWER: Unfortunately because this is a proprietary recipe we can only give out the specific ingredients list after purchase. There are some very good hints in the description. Its a great beer to make. Does this require secondary fermentation? I brewed this in my catalyst. No secondary transfer but I did do several trüb drops to get rid of all the hops. 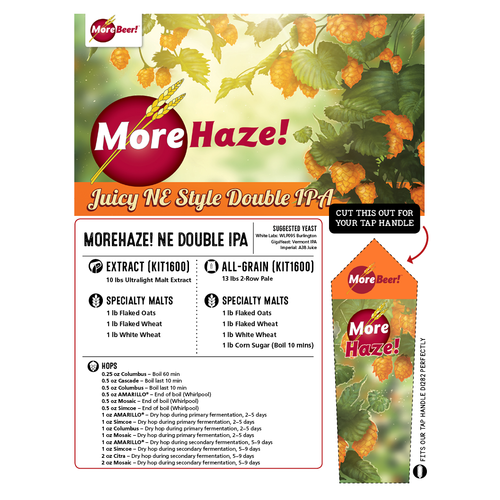 No, the whole point to a hazy ipa is to keep it hazy. It's better to drink these beers fresh. Dry hop as directed and let it continue to ferment until ready to bottle. Short answer, no. It will be less hazzy if you do. BEST ANSWER: Yes, you can add priming sugar to increase the ABV. I often keep some light DME handy if I my post boil gravity is not where it should be and add it to hit my target OG (make sure your wort is still above 180-190 when you add it and stir it well to dissolve). DME willl have a different effect (color and flavor) than priming sugar, but no big deal. Use it. Yes you can. It will increase the abv but will also change the body, and flavor among other things. I would strongly suggest brewing this one according to instructions. It is a very good NE ipa as is and plenty strong enough. Yes, you can. I do this all the time because I usually biy kits and keg - I always have extra lying around. I recommend adding with 10 left in boil. I have added corn sugar in the past, but the preferred method is DME 1 lb. Golden Light. I added the first round of dry hops in a sanitized muslin bag. Do I do the second round of dry hops with the first still in my fermenter or take the first out? 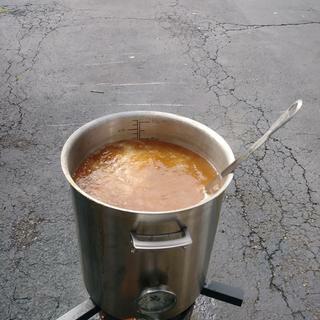 I am using an SS Brewtech 7 gallon brew bucket and NOT transferring to secondary. Just leave it all in when you add the 2nd dose. I did not use a mesh bag and it came out nice and hazy at about 9% ABV. So be warry. I hop in order and leave all hops in fermenter until I transfer to bottle. I leave them in...the more the merrier. BEST ANSWER: I wait until it stops working in the fermentation bucket and then bottle. Normally takes a couple of weeks plus/ minus a day or two. 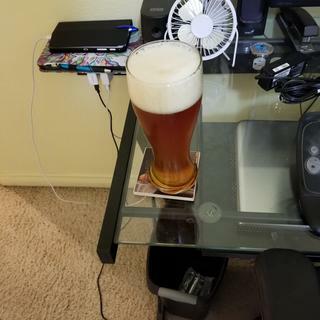 I brewed this on August 25. Without a starter, I pitched one pack of gigayeast directly into it (appx 3 months from manufacture date). 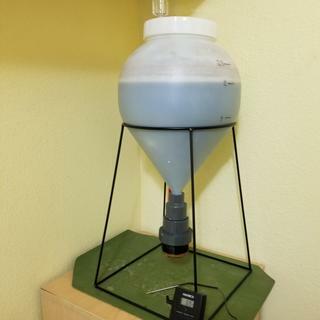 I took an original gravity reading around 1.070. Fermenting did not start for 24-36 hours but now there is thick Krausen and lots of activity but still no air bubbles in airlock and I have sealed the lid in case it was leaking. Should I pitch more yeast at this point or just let it go? BEST ANSWER: Hi James - If a thick krausen is present, there may still be a leak somewhere. 1st brew ever. Took about 12 hrs to start seeing real action in my blow off (using SS Brew Bucket). Fermented like crazy for 4 days. Changed blow off jar because 1st one was getting nasty. Careful to sanitize everything. Noticed later that day fermenting slowed to crawl. Day 5 added 2nd dry hops. No more krausen at top and color looked dark. Seemed like i saw some action again for a bit then stopped. Tomorrow is Day 6. Is my beer going to be okay?? Advice please!!! BEST ANSWER: Hi John - Sounds like you have a great fermentation going and nothing to worry about. Dry hopping will increase activity in your blow of from the hops releasing absorbed co2 in the beer, these nucleation points will also break down the build up of krausen. Sounds like you have a great beer on the way and nothing to worry about. What is the FG supposed to be? I'm stuck at 1.040 and put in primary over a week ago. Can i still add another yeast? BEST ANSWER: You want it to be around 1.008-1.012 so possibly rousing the yeast gently, adding another high gravity yeast strain to lower that FG or warming the fermentr up so that the yeast can finish things up. How much yeast should I use for this recipe and what kind? BEST ANSWER: For any recipe that has an estimated abv of over 6% we recommend using a yeast starter or two packets of yeast. 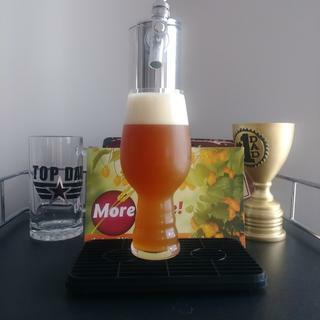 This is the best NEIPA kit on the market for extract brewers IMO. Well short of target OG (1.073 compensated). First of well over 100 Morebeer kits to miss the mark. Most expensive kit - expected much more. Superb! Super easy and incredibly delicious. On a recent vacation to Vancouver, BC enjoyed many delicious brews. My favorite was a hazy citrusy NE IPA. Though mostly an all grain home brewer, opted for the Extract beer kit. Made a yeast starter, followed the ridiculously simple directions, and replicated a stunning beer. Grapefruit tones abound backed by a hazy malty sweet backbone that amazes all who have sampled it. This one will not last long. Carbonated to perfection in 24 hours using the carbonation lid available on this site. This beer was AMAZING! 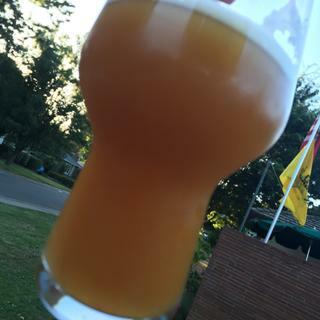 Finished fermenting in 10 days, kegged it, and forced carbonated it for 2 weeks. The aroma is of hops, citrus and godlike power. More hoppy than Bugs Bunny and stronger that BEAR-cules (hercules? anybody?). This is far and away my favorite beer! I will not only recommend it to all my brewing buddies but I'll let them try it so they know the truth first hand. 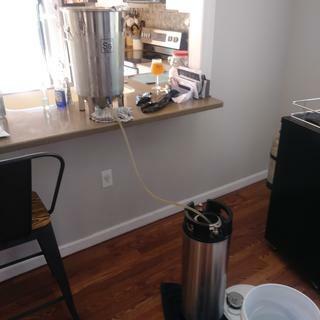 I used the the Korney keg jumper line (KEG575) to transfer from the keg I used to do my second round of dry hops to my primary serving keg and it was amazing, no oxygenation of the beer or loss of flavors. Yeast used for this was London Ale III (WY1318) also highly recommended. Very nice kit. Easy to make. Very forgiving recipe. Use a higher end yeast (it gives you a better beer....duh). This beer does benefit from a second fermentation (due to settling of hops and yeast). 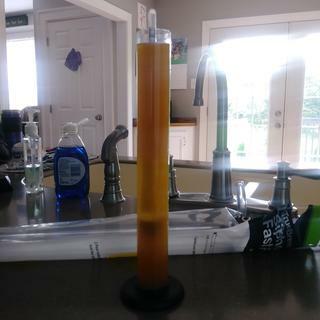 Brewed this in glass carboys, if you use plastic buckets be aware that there are a lot of biologicals (hops) that might find their way into scratches in your buckets and create "skunk" brew in your next batch. Beer tastes great, great HAZY color and texture, nice alcohol content, without a "boozy" taste. This brew is definitely in the top 20% of beer I have made. I recommend it Highly! 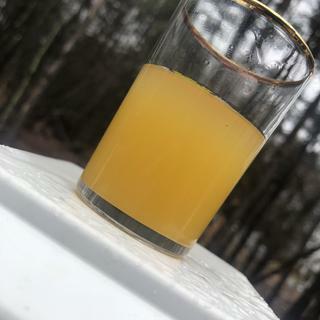 This is absolutely my favorite brew I’ve made so far. I absolutely recommend making this outstanding nectar of the gods. 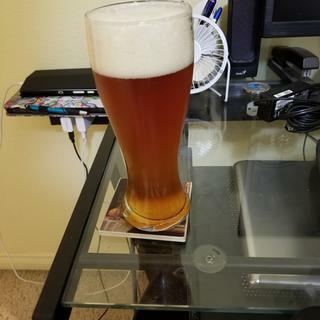 This was my first ever homebrew. I missed the mark on the OG (1.075) I assume because I couldn't get all the LME out of the two bags. I pitched two packs of gigayeast and about 15 hours later it took off. Dry hopped as scheduled and left them in. Airlock activity was done by day 4 which worried me a bit. Day 11 I took a gravity reading. It was 1.009 (8.7% abv). I cold crashed in my SS brew bucket and transferred to a keg on day 12. I force carbed and starting drinking on day 13. It was delicious and dangerously smooth. I love NEIPAs and was excited to make this one. The flavor is fantastic with some strong hop flavors and aromas but less bitter than most other IPAs. The cons, it tended to be darker than I would have wanted but no biggie. 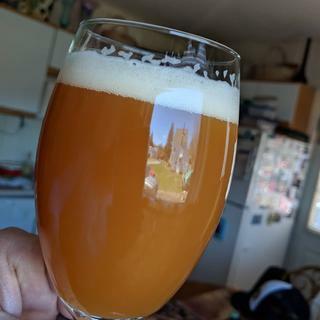 NEIPAs are traditionally cloudy and this one was very cloudy, this is due to all the dry hopping. I did use muslin bags to add the hops but there was still a tremendous amount of trub. I felt I lost a significant amount of beer to the huge amount of trub in the bottom of my carboy. Overall, I love the beer. I am glad I made it but I think I will be trying my hand at a different NEIPA recipe soon. Great review. New England IPAs are definitely a practice of inefficiency. Not sure I got exactly what I was suppose to. There beer turned out an amber color. I followed the recipe exactly. My first thought when I opened one was it was oxidized, but from the time I poured the extract in the wort was always this color. First time home brewing and this on has got me hooked! This NE DIPA has one of the best noses on it that i have ever smelled. The hop aromatic profile was on point. The flavor was a bit more muted. Has a soft mouthfeel. I may just buy this one again just to mess around with the dry hopping to see how much it changes the flavor profile. Poor lighting due to time of day but has a bright orange color. I really liked the beer although it came out much darker than the picture shows. 9.4% ABV. My OG came in significantly lower than what was posted (1.083-1.086): 1.075. Maybe I didn't get enough of the extract out of the bag? (I even warmed it first). This was also my first time using a yeast starter (with GigaYeast Double Pitch - GY054 Vermont IPA Yeast), and I think that helped get the FG down to 1.012 =8.27% ABV, with a calculated 84% attenuation, not at all bad. It's super floral, super juicy, makes me think of orange juice. Bitter is on the low end, which is great for my tastes, but them smells and flavors are all over the place. Obviously this leaves a ton of hop-trub in the fermenter: I use a conical FastFerment, and this was the first time I had to siphon out of that to a bottle bucket: The collection ball&valve would just get too clogged up with the stuff to be used effectively. But at the end of the day, it turned out great, highly recommended if you'er into this type of beer. This beer is next level amazing! So much so that even with 12 taps this is my go to pour. I’m on my 5th batch of this awesome in a glass in under three months. First time brewing I did a single kit....next two times did 10 gallon batches so there is always a keg of it available to drink. I always double pitch London ale 3 wyeast. And two times added an additional 1 ounce of citra and 1ounce of mosaic CRYO hops as a last dry hop addition. These are dropped right to the unitanks, as I can dump them before kegging. 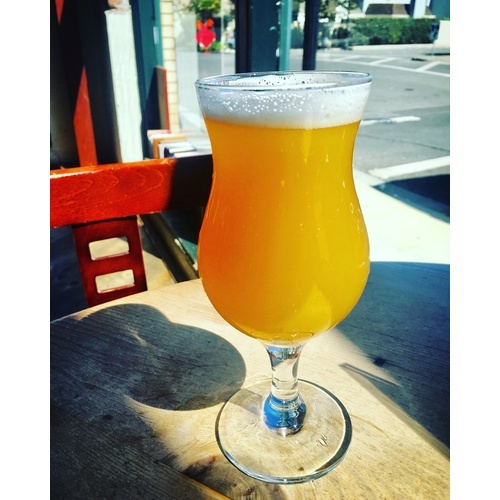 If your on the fence and like IPAs this should be your first NEIPA. Click the buy button and prepare to be amazed with the results. Great kit. First time double dry hopping and didn't take absorption loss and end up low on final volume. Overall a great deal. Good overall, little light on flavor but it may come around with some time. The Aroma of the hops while it was dry hoping was awesome. I used a grain bag for the hops but didn't get the orange color or the haze. Mine came out more of a copper color, but it was still awesome. Next time I'm throwing the hops directly into the fermenter.